Timescapes - Digital Timelapse Discussion - View topic - So You Call THIS Motion Control??? So You Call THIS Motion Control??? With all the amazing information about motion control rigs stored here, it is really bad that no one has added anything new this year. Stepout MOCO has received several requests for complete, turnkey MOCO systems since posts here have fallen off. When the forum was active, people just read about what D1, or Doug, or Gerald were making, and asked a few questions. Then they could build their own rig. Now, its not so easy, and we are getting requests. Apparently, I tell them too much about how it works, because they then go off and build something themselves after receiving hours of advice by email. Here is a video of a miniature scale model elevator I made to test the board and code before it runs the full size elevator. Farewell Viewers, I hope to have something else to post later. Re: So You Call THIS Motion Control??? may i formally suggest a been growing timelapse competition. i'm thinking beans would be simple to implement.lets see how inventive people can be. first prize is the admiration of your fellow forum members. maybe we can grow on from that no pun intended. it would be nice to see other peoples approaches, techniques we would all probably learn something. sl i like that your diversifying your product range that can only be a good thing right ?. does it really matter if they want to make it themselves so long as you get royalties off each one who cares maybe they will sell a million maybe not everything is a gamble. you probably need two yachts one for yourself and one for the moco stuff but remember no man is an island haha. i hope you stick around the forums you have contributed a lot it be sad not see you keep participating. i guess i'm one of those people you talk about. sponge is the correct adjective i think lol. but i have to thank you guys and tom for the forum with out your knowledge, graciousness to share i would not have the interests and hobbies i now do, and i think my life is broader and more colourful for the experience. Likewise. Thanks for the post. In a capitalist system I guess you have various options - either negotiate a price that covers your work effort including how much worth you think it represents to the client, or else say no. Unless you intend setting up your own elevator company or you know a competing one to sell the idea to, then "no" might not be an option. I'm sure the company that wants the controller could contract elsewhere - the trick is knowing or guessing how much more it might cost them. In the best of worlds every one is honest and will pay a fair price, but you are in the USA so bad luck! Making it a condition that you supply the hardware seems like a fair compromise and is a common approach, but how hard did you try for that? Though even if you did insist on right of supply, if the device can be copied, then you have no certainty the client can't go off and ignore it... they can after all just send a sample to China and get a 1,000 or more made in an instant. PS - why is the site so dead? Maybe because there are so many Chinese and other "simple and cheap" options, and the hipster appeal of DIY has faded? I think people have also drifted off to the many crowd funding options and ether satiated their needs or realised it was too much hard work anyway. Timelapse has also been a bit oversubscribed and lost its novelty I think. But motion control is still something of relevance and the obvious response would be to start up a new forum just for that. As I wrote the other day on Tribal-Warrior's current thread, there are former regulars on Timescapes who are now doing excellent commercial work, very possibly having gained significant help in their early endeavours from this site. That they are now too busy to hang out here is a positive thing from their own point of view! D1's threads kept a bunch of us busy discussing all things related to software-driven motion be it camera rigs or CNC routers but even he is (I assume) now too busy using his machines for their intended purpose. I like the idea of a bean-growing timelapse competition but am already too busy with several other projects (which are spin-offs from what I first learned here) to consider participating myself. Hello all yes still here ! Was hoping their would be two nice little builds progressing in the Off topic CNC Build . Dont know if Kit and Edward have found some CNC forum to lurk or what . If you have let us know will pop over and have a look . I would be interested to see how you both are progressing as you have two very different approaches to the problem . Kit, cost effective and a evolving process . Edward, pre planed thought out and hi end components. On the Moco front yes gone a bit quite . Their was a realisation on my part that any big job will always prefer to use the likes of a Mark Roberts . And any small independent job will be stuck for cash and build their own or try and borrow your rig . Fact of life really . So yes i have sold a few rigs over the years to people who understand what they needed . Something better than a quickly thrown together thing to get job done. But not as complicated or expensive as a Milo . My rigs are still working and people are happy . Did i make any money out of it ? No i didn't and i never thought i would all the money went back into building more rigs. So it was a self funding Hobby basically i believe sciencelookers as always had more commercial thoughts that may have been misguided . This forum as always been for enthusiasts really and probably why its so quite now people are less enthusiastic about timelapse because your smart phone can do it which means everybody can do it. The challenge as gone . I am hoping my Moco will continue hope to build another crane eventually with extending boom but somebody will have to pay me to do it . So who knows could be a long wait . I did notice the Volo is back in production https://www.arcmoco.com/ It say with increased repeatably which makes me wonder if the original suffered in that area which is very bad for animation as two passes at least are usually required for rig removal these days . Its a lot cheaper than a Milo but main was cheaper so ya never know wont close the doors on Moco yet . Good to see you all here! Still interested and not only that, using my moco in the studio practically everyday, albeit for still life subjects. No progress on the router yet, Since I retired (well, semi-retired really) I've done what most people do, travel a bit, laze around, take it easy. But I have also had to sell masses of equipment that I no longer used, whilst retaining what I do use. So all my expensive Broncolor flash equipment has gone, as well as several cameras. I still have six cameras to sell. Keeping the digital back as I need it for work. Basically I need to free myself of all the superfluous package before I embark on new projects. Almost there. Motion Control has always been quite niche, and now the new fashionable toys are the small gimbals which you can buy for next to nothing. I want one, but a four axis one, to stop vertical bounce as you walk. As soon as I proceed with the router, I will post. D1, good to know you're still out there, and Edward too. My own CNC machine is looking a bit sad at the moment. I made the big mistake of fitting it with 10mm x 2mm ACME leadscrews which was a big mistake and have since bodged in the 16mm x 10mm ballscrews we talked about a few months back. The blazingly obvious weakness now is the lack of rigidity in the MDF end-plates of the gantry which resemble slabs of butter if one of the two ballscrews jams up. I've done a pile of sketches of a new machine with a steel frame that uses the existing motors, ballscrews, rails etc but haven't yet started work. As ever there are any number of other distractions. The new gantry will not have the 'traditional' side-plates, end-cheecks, or whatever the correct name is, but will be made from a length of 100mm square section steel tube which bolts directly on top of the plates holding the wheels that run on the aluminium extruded rails. I'm going to turn the rails so that the wheel plates are horizontal insted of vertical making the basic construction simple but very solid. The rails, and the plastic 'V' wheels, will become the weak point of the machine but the design allows for an upgrade to Hiwin or similar rails without major mods in the future. The rails need to be lifted well above the height of the machine's bed to get the Y axis at the correft height but this design makes the construction of a very rigid gantry so much simpler. I have a few non-critical bits and pieces I want to make with the machine as it is before I start tearing it apart again, but there will be pictures and even a video eventually... eventually. One of the distractions has been the semi-automatic weaving loom I've been working on on and off for a couple of years. I've finally managed to get the software to work!!!!!!!!!!!!!!!!!!!!!!!!!! It's taken several attempts to make all 5 Arduinos play together but sucess finally came when I realised that using an interrupt to flag a new command was what I should have known from day one! Mechanical finishing touches are under way and, with any luck, we will actually be weaving cloth in a week or two, hopefully before my wife's birthday at the start of June as it will then be two years since I gave her a box full of so-far-unused weaving thread as a present! So Kit, back to basics then, weaving your own pants. You already know how to start a fire and smelt metal, can you make sharp spears to hunt kangaroos too? On the Hiwin front, there are other Chinese brands that are budget and apparently quite good, according to the CNC guys, (anything is better than the V wheels) so hopefully you will upgrade them too at some stage. I recouped Gerald's Mantis investment long ago. Time is money. Hello all . Hi kit what was the big problem with the 10pitch ballscrews . Is it just that they can make everything go fast the actual structure isn't up to it ? I intend to speed mine up eventually for reasons i will explain latter . Having your side rails high above the bed is not a bad idea as you say make construction easier .You also get the benefit of the rials been out of the way a bit , As i dont have extraction on mine crap gets everywhere . Hi Edward well if you are selling gear off it will at least give you a nice healthy pottering fund . My router is working in real life now and its doing what i want . Theirs a little list building up of improvements that would be good but not essential . Mine is all boxed in now but i need to put a small extractor on it the type you get form bathrooms kitchens etc . This will cause a negative pressure in the box so the seals dont have to be perfect . At the mo dust finds all sort of places to escape so the fan wont pull huge amounts of dust out but it should stop stuff escaping from the box . Well thats the theory. I can cut ali now getting speeds etc right is critical and clearing swarth is important . If you dont it can quickly gum everything up the speed of the spindle just melts it .My little blower does the job i have set the pulse rate so it clears things nicely. But if you are just going to be cutting ali Edward i would consider going the fluid route and lots of it . This of course would effect how you build things considerably. 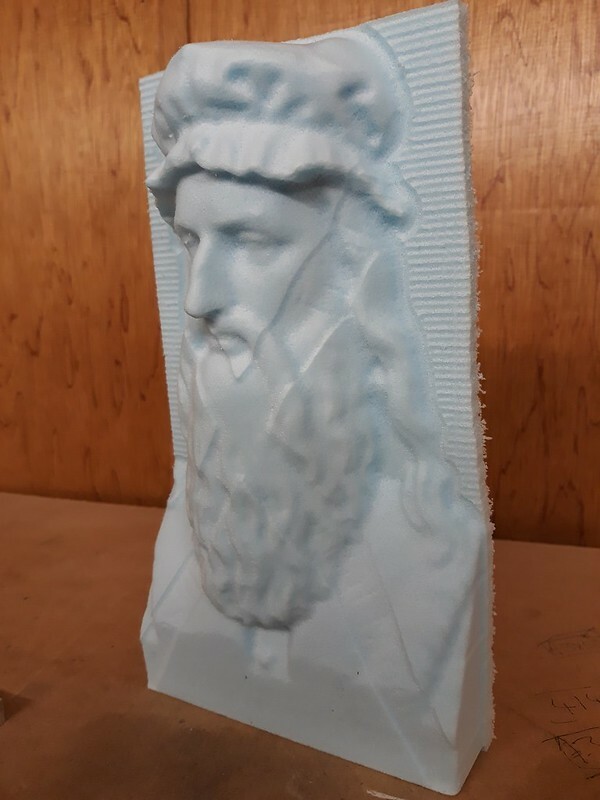 Its Leonardo Da Vinci when 4th axis is done i will be able to do the full 360 head . I am using blue foam which machines very nicely quite soft but just hard enough. I can run the router at full tilt without any problems in fact i would be good to double the speed of the feeds for this job hence my need to speed up the ballscrews eventually . Anyways look forward to seeing more pics of everybody's various projects . If I didn't know you better, I'd think you were taking the p**s I'm ultra jealous that you've even partly retired. Which parts of you are still working? I turn the dreaded 60 next month and still have a sizable chunk of mortgage to pay off before I can become a man of leisure. I've seen the cheaper hi-win style rails on Fred's website but wasn't sure if they were any good. I'll have a trawl through the MYCNCUK archive for comments on them and might bite that particular bullet immediately. The 2mm pitch ACME screws were way too slow. The 10mm ballscrews are simply a joy to play with after past adventures with galvanised allthread, ACME screws and timing belts but they are longer between the bearings than the bed was designed for so there are layers of 18mm plywood shims holding things in place. The move to bigger motors ( I used to use NEMA17s) and the ballscrews has really shown up the weakness of a wooden frame and the rigidity of the 16mm diameter ballscrews also makes accurate alignment more critical otherwise things tend to bind up as I think you discovered yourself. I started out with the plan of making an ultra-cheap machine just to see if I could and tried to 'upgrade' from there rather than just saying 'yes I can!' (who am I, Bob the Builder?) and spending some real loot on a complete new build back then. We live and learn. D1, Very impressive 3D cut, and it looks quite good definition too.I can't wait to see what you do when you finish the 4th axis. I guess this is very useful for the kind of work you do. I'll bear in mind what you say about using lubrication. I was hoping a mister with a good supply of air will do the job, I'll have to experiment, but I am a long way from that yet. Good to read that you are still around, guys! That looks good. What size camera are you planning to use with it? For most of us amateurs the move to lighter cameras, even just phones, has made the moco equipment much lighter and simpler but for serious work you still need a big heavy piece of glass at the front. it´s designed for such cameras like Sony F5, RED, Alexa Mini, etc. I´ve tested it with a F5 and that worked fine so far. Location: The Great White North, EH! Still here, still lurking, although it has been awhile since I posted. My moco shenanigans have taken a back seat to personal goings on but soon I will be back at it. Having now reread your post a better response is needed. Moco I think in general has fallen off due in large part to that gigantic economic machine known as China. There are now a plethora of cheap moco rails that can be purchased on line. As to how accurate they are is an unknown. So many choices, can’t keep up. There is always an optimum moment when the market is new and hasn’t reached saturation but I think that time has come. Building bigger rigs like the Volo will never be profitable. Not enough need. Once purchased very little need for another, unless you are Laika, who may have two or three, maybe. I had a few calls from small companies who wanted a Volo like crane, but when I gave them a quote they could not believe the price! I stopped responding to those emails. There is a small market still there but not sure if it is a viable one. The boat idea sounds cool. Kind of like the tiny house revo that is going on right now. I hope things change for the better for you. WOW! Its great to see you guys have kept on posting interesting stuff here. I've been reading some of the old posts as I've been getting some of my toys working again after spending (I'm not even exactly sure how long) fixing boats and designing an elevator controller. Timescapes is the most amazing repository of knowledge for everything related to timelapse, MOCO, and stopmotion. I'd like to get the nephews interested in stopmotion and MOCO but they are more interested in the animations and the toys than actually animating a scene. The six year old is becoming a pretty good welder though. The elevator company built a rack for solar panels that covers the back of my boat as partial payment for the elevator controller. It holds the solar panels, provides shade, acts as my dinghy davit, I hang fenders and dock lines on it and it has a lighted ceiling below. In between the few jobs the past two years, I have rebuilt two old boats. One is a 1975 MacGregor 25 foot sailboat and the other is a 1988 Carver 27 foot sport fish powerboat with a large cabin set up to live aboard. You can see me rebuilding the boats and a little shakedown cruise on the sailboat on my Youtube channel "Nine Hundred Dollar Luxury Yacht". The Carver should be ready for a cruise to the Bahamas this Spring, hopefully leaving in mid-May. I plan to go to one of the most remote areas, rarely visited and completely uninhabited. If you want to see where, search google earth for "scrub cays, Bahamas". There are a few tiny islands in the middle of a 35 mile long sand bar. Its not on the way to anywhere from anywhere and is visited maybe once every few years by curious cruisers. It has un-polluted water and reefs that haven't been fished out. I hope to arrive by the beginning of June and stay through the end of July. The boat can carry enough frozen food and water for an even longer stay and generates all the power I'd ever need. I just finished re-creating my vertical lens motor for the Dynamic MX-2 controller on that 10:1 zoom lens and plan to take it with me along with a stage one dolly and an eMotimo. I also have some underwater action cameras and my usual pile of camera stuff. There is no job. I plan to shoot whatever I want, and try to actually enjoy using the stuff I've spent all these years making. Becoming a photographer again instead of a photo equipment maker or boat fixer because I enjoyed doing the photography the most. At the moment I plan to come back at the beginning of August to avoid the increasing risk from hurricanes around that time. If I find fresh water, catch enough lobsters and fish and get some sort of grunge life going in a hut made out of palm fronds, this may just be it for me. I'll post videos if I make it back. Assuming I make it back, next summer's destination is Cay Sal Bank, a huge atoll between Florida and Cuba with several uninhabited islands scattered around its rim. After two summers of cruising, I'll decide if I want to rent out my house and do this full-time as the first phase of retirement or if I want to come back and make stuff again. Right now, a hammock strung up between two palm trees, drinking alcohol out of a chopped in half coconut sounds pretty good to me. And if there are turtles there, I'll have to timelapse them to see what they're doing on the beach all night, and if that differs from what they do in Florida where nearly all the beachfront is developed. Because using photography to learn new stuff is cool.